To heck with the foibles of the Brit. Anti-art Establishment. Time to view a beautiful picture. This is another example of Science beating Art at its own game. The Sebangau Felid Project captured this photo of a Bornean Clouded Leopard (Neofelis diardi) in Sebangau National Park, Indonesia, on 3 July, using a remote camera automatically triggered by animal movement. 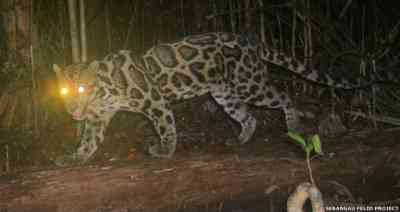 This is the first time this rare species has been recorded in Sebangua National Park. What a beauty! Click the title link for a larger image and more information.